Since 1997, Yerba Buena Center for the Arts has mounted its signature triennial titled Bay Area Now (BAN). Each edition of the program marks a moment in the life of the institution and regional art scenes through the work of the participating artists who are seen as representative of the spirit of that particular time. For BAN7 YBCA has partnered with fifteen Bay Area arts organizations who will create a dynamic art fair environment by curating site-specific projects throughout YBCA’s galleries and campus. Montalvo’s contribution to BAN7 is Finding Your Center, a self-help audio gallery tour and distributed sculptural intervention organized by artists Susan O’Malley and Leah Rosenberg that playfully responds to our ceaseless quest for calm, balance, and equilibrium in the face of the demands of modern life. Using color, voice, shape, and sound, and responding to the unique architectural features of the YBCA, O’Malley and Rosenberg lead visitors through the exhibition spaces in search of an elusive center that is both physical and internal. O’Malley’s affable tour guide narrator relates humorous personal anecdotes, interwoven with moments for self-reflection and gentle prompts for listeners to engage with the exhibition environment in ways that inspire calm. 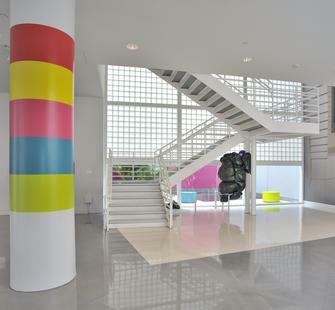 Rosenberg responds to the repetition of the basic shape of the column in the gallery space and accentuates its presence using a color palette designed to induce feelings of wellbeing. An edition of four round colored stools that visitors can use to rest, reflect and relax accompanies her intervention. 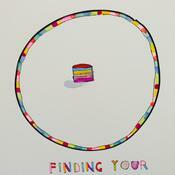 O’Malley’s socially-based work includes offering Pep Talks, asking for advice from strangers, and installing roomfuls of inspirational posters. With her projects she aspires to inspire hope, optimism, and a sense of interconnectedness. Rosenberg’s practice spans a range of media including painting, sculpture, installation, and cake. Central to her work is an ongoing fascination with the complex workings of human emotion and the pursuit of happiness through color, form, flavor, and arrangement. Finding Your Center is conceived in dialogue with Montalvo’s current multiyear theme about health and wellness, entitled Flourish: Artists Explore Wellbeing and is envisioned as a site-specific response to the decentralizing impulse of BAN7. Consistent with the Lucas Artists Residency Program’s commitment to fostering cross-disciplinary collaboration, the project features partnerships with San Francisco writer Christina Amini, Seattle composer and Lucas Artist Fellow Tiffany Lin, and Bay Area industrial designer Ben Larame. Additional support is provided by Stoneman Studios, Milpitas, California and the James Irvine Foundation.